Acupuncture is an ancient medical therapy that is performed by placing sterile needles in specific points on the body. The original theories of Traditional Chinese medicine believed that certain points on the body regulated flow of “Chi” (energy). Medical acupuncture uses current knowledge of anatomy, physiology and pathology of these specific acupuncture points. There are 14 major channels with points that are comprised of nerves, blood vessels and myofascia. There are both local tissue effects (reduction of trigger points, fascial release, increased local blood flow, release of microinflammation, stimulate nerve communication) and systemic/homeostatic effects (autonomic balance, immune modulation). Acupuncture is used to treat; Musculoskeletal conditions (arthritis, soft tissue injury), neurologic disease (disk disease, degenerative myelopathy), post-operative pain management (not affective if local blocks are used), skin disorders (acral lick granuloma), KCS (dry eye) and urinary dysfunction to name a few. The first appointment includes an examination and the first acupuncture treatment. Many times the first treatment is aimed at allowing the pet to be introduced to the needle placement and identifying the goals for treatment. Each treatment appointment is 40 minutes to allow time for the needles to be placed and then remain in place for 10-20 minutes ideally. Points are placed based on palpation and clinical indications. The time period between acupuncture treatments varies. Typically, it is recommended beginning with three to five treatments, which may be every other week, once a week, or biweekly. As the patient shows improvement, treatments can be spaced further apart, or even discontinued. Some patients show marked improvement immediately following the first treatment, but most patients typically improve after three or more treatments. Chronic conditions may take longer to respond. 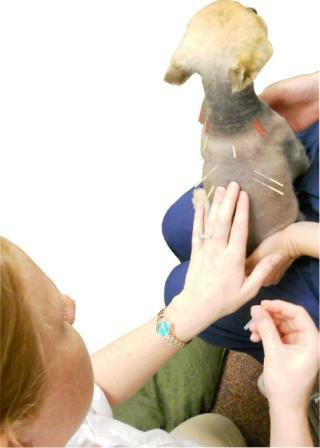 What is a Certified Veterinary Acupuncturist? Dr. Demyan is a 2014 graduate of Colorado State University’s College of Veterinary Medicine. 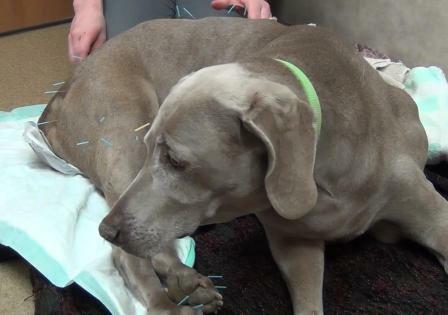 She completed 84 additional hours of Medical Acupuncture for Veterinarians (MAV) course work to earn her Certification. She is able to provide safe and effective integrative medicine for your pet. Call today to schedule your pet’s acupuncture appointment with Dr. Demyan.